I don't really have a top five, although my favourite so far would have to be Mort. Well the only ones of read are Sorcery, Eric, Interesting times and The Last Continent. * "You're Hells Angels, then? What chapter are you from?" I assume you mean Shadwell and not Newton. "hoor of babylon!" 4. Uhh... ermmm... I'm not sure after this. I love them all! I haven't read Good Omens yet, but a lot of you says it;s good, I'll go pick it up. The next Pratchett book I will read might be The Amazing Maurice and his Educated Rodents. Good omens= a squillion times better than Maurice. Dont waste your time with maurice, its not that great. Good omens is the greatest book Ive read in ages. Krakow Sam is kinda right. The distinct lack of cursing among other things kinda muffles the flavor in the 'Children's Discworld' books. At least that's how I see it as far as I've read. Amazing Maurice was one of the darkest discworld books I read. 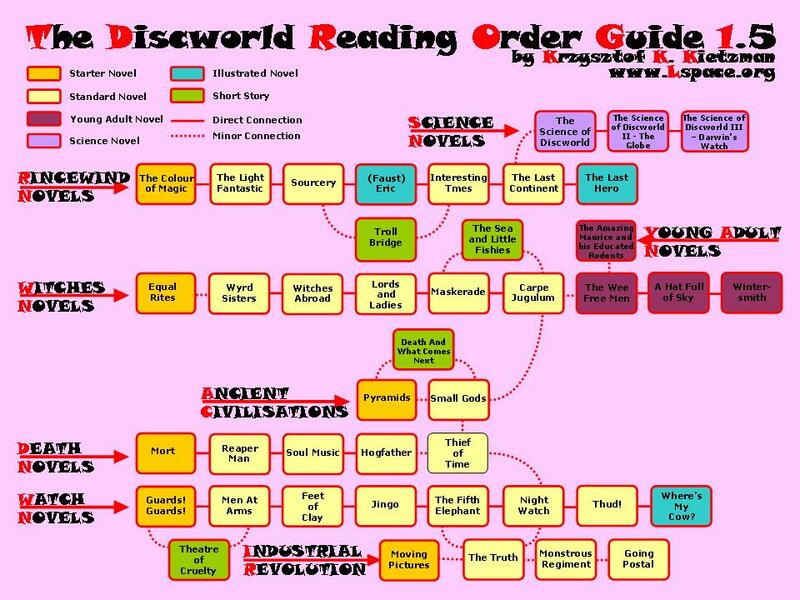 That's a discworld book? Eh, I guess I've read one then. I'm a big fan of Pratchett's work, I have to say, however, that I honestly detest the stories following those three Witches. The Night Watch or Ridcully/Rincewind are the best ones. Sam Vimes is just a brilliantly well done character in my opinion, and Detritus' "Piecemaker" ballista/crossbow is fantastic. Reminds me of a D&D Campaign where one of my companions had 26 strength and carried around a heavy ballista with thunderbolts in it. Fun times.